Locked up string bed with Kevlar is a recipe for arm problems. I played 3 sets of doubles last night.... All 4.5 players. So far, I've spent a 1/2 hour hitting on a ball machine. 1/2 hitting serves... And now 3 sets. The stringbed is completely locked up. I think i need to keep a bottle of silicone spray handy to keep the strings sliding. When the strings can move, the kev/zx playability is sublime. Spin, control, soft feel.... it's all there. When the strings lock up, it's painful to hit with. It feels like I'm hitting with a 2x4. Speaking of spin. I've always been a big topspin player.... Playing into being a lefty. On 4 occasions last, I was shocked that balls dropped in. I usually know/expect certain balls to drop in.... But these were shots where i felt i over cooked it..... But the ball dropped like a rock l, safely in the baseline.... Leaving the opponents in wonderment. So, the spin factor is real with this combo. What really impressed me was the directional control on this combo. It reminded me of a well worn in full gut stringjob. The type of directional control where the ball goes exactly where your mind intended it. It was very confidence inspiring. As the night wore on and the strings locked up, all the wonderful qualities i just mentioned went away. The kevlar is notched up....and one mishit in the upper hoop completely tore through the outer braid of the kevlar. I'm pretty sure this stringjob is at the end of days. I'm spray it with silicone to see how much more i can get out of it, though. That unraveling in picture A is very hard to explain, since it doesn't look like much wear is happening in that part of the hoop. Picture B is pretty much normal. Although I would say there is more scuffing from ball contact than at the string intersections. It is unusual that you prefer the feel of the Kev right at the start, since most users find Ashkev boardy before the fibers start to relax after about 30 minutes of hitting. You might actually prefer one of the mono Kevlars like Prince or forten, as they hold tension better. BTW, the ZX crosses still look to be in good shape. There's definitely scuffing from the ball action, but if you look closely, you can the underside of the kevlar is cupped already from the zx. Not bad but noticable after not a lot of playing time. No idea about the the unraveling. I think it was a mishit but still don't know why it tore. The zx is definitely in good shape but I'm not much of a cross string denter anyway as my stroke is very much across the ball rather than through the ball. The zx isn't slick though. Just a couple quick comments since I have been playing with Ashaway Kevlar 16 and Ashaway Monogut ZX Pro 17 for a solid year in a few different rackets. 1. Pre-stretching is a must, especially on the ZXP. I didn't use to pre-stretch the Kevlar but now do every time. More on pre-stretching below. 2. I get 15+ hours easy with this setup, sometimes more. 3. Kevlar will always break, ZXP is nearly indestructable if you don't break it while stringing. 4. ZXP can be reused over and over if you want. Doing it this way you never need to pre-stretch (again). My best playing racket has crosses with 2 different pieces of ZXP. 5. I'd go crazy without a dampener of some sort with this setup (its the ZXP that makes the unwanted noise/resonance). 6. 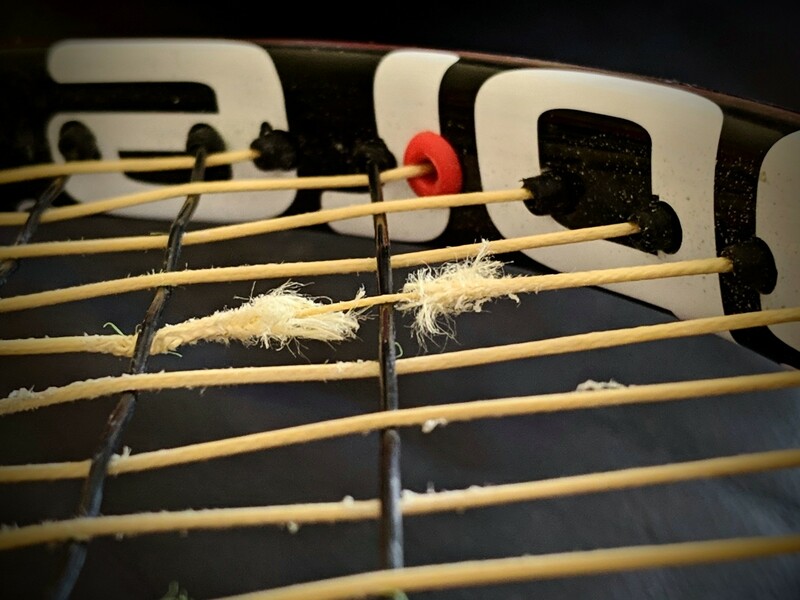 I don't use any lubricant on these strings in between matches -- i feel like it may "clog" up the kevlar braid and also cause dirt to be retained a lot more. 7. Stringing is SO easy with Kev if you make sure to cut the ends with sharp scissors (not wire cutters) at an angle. Even easier to string that 18g syn gut. 8. Black ZXP subjectively has better "feel" to me than the natural and also tends to break less during the stringing process. 9. Kev/ZXP is very comfortable after you get past the "boardy" phase. If you string the night before, I find the "boardy" phase is considerably shorter or non-existant. At its worst, it takes 1 hour of hitting for the string bed to feel great. 10. Kev/ZXP provides excellent spin potential, is quite controllable, and very consistent over its lifespan. The ZXP provides great power but be careful if the racket face is too open as the trampoline effect of this string is greater than just about everything else (slightly worse than NG?). 11. The only real downside I have found outside of having to pre-stretch is that touch shots are nowhere near comparable to NG or Syn gut crosses. I never found great touch with the various polys I've tested either. By touch, I am referring less to crisp volleys and more to being able to execute fantastic drop shots through pocketing, etc. How do I pre-stretch? Well, I measure ~20' of ZXP. Then I tie one end of it to a baseball bat (barrel on the ground, knot around the top of the bat grip) and the other to my outdoor gate rod (which slides down into my concrete patio). I then walk away from the gate with the bat until the string is taut and level. I then put a yard ruler on the ground at "0" where the bat head is when the string is taut. I then pull back on the bat handle with moderate force, rocking it back to straight up position. Within 5 seconds I am able to pre-stretch ZXP 4-6". I continue this process. Within another 20 seconds I am at 12-14" of stretch. And then continuing on past this point, things get a bit harder but still no biggie. Over the next 45-60 seconds, I continue until I am 22"-24" away from where I started. ZXP pre-stretch is done. For Kevlar, I follow the same process but it is massively abridged. After tying and getting the string taut, I give it a good pull or two and can get 2-4" out of the Kevlar within 20 seconds. Done...it would take massive strength to get anymore out of the Kev. Ultimately pre-stretching used to be a PITA for me but now I have it down. It literally takes an extra few minutes and is well worth it for best duration of playability. On a related but separate note, I have used full bed ZXP with good success (if I can get it strung). After pre-stretch, I would experience a lot of breaks during stringing on the mains...never crosses. So, if I could get the mains strung up, all was good. But, I would break during stringing (at 50 lbs) about 25% of the time. What a waste of $$ and time. Playability was generally great with the black...never got the natural to play as well. I would get 12-15 hours of full bed ZXP before the ZXP would saw through itself. Thanks for that run down on Kev/Zx. As some one who plays tournaments and has to string frames before and during events there are way too many factors going on with that set up. The string breaking on the stringer Is a problem. The D1 girls experience is telling as she broke the string in the first 5min and goes through it fairly quickly considering durability is initially why many would want to try this string. Her comment that she gets 1.5 week as long as nothing happens speaks to a stringbed that is questionable. Not having consistent results off the stringer and not being able to play with a set up immediately are issues I wouldn’t care to take on. The cost is irrelevant. It is sort of like guys who play gut poly and if the gut lasts the poly is still dead after 4-8 hrs. Boy is that expensive. In fact we tried that. Already been through fullbeds of Luxilon, Tour Bite and a couple others including poly x syn gut hybrids. She likes Ash Kev x ZX. It is fun to see and to discuss with her. Most of these kids use whatever they get from the school or started with through their junior coach. When we first met I asked her why Lux 4G at 58lbs? She said, "That is what coach told me to use and the team stringer would string my rackets?" Earlier this summer she had to transfer to the local uni and we got a couple of hits. That is when I asked her if she had ever tried various strings and rackets. She shook her head as if it was never an option. Fascinating. When they are playing with one of the best options available why would she get in her head about strings and needing something different? That girl sees other D1 players and the best players in the world using Lux Alu so why question what she is using? She wouldn’t and being up in her head about strings isn’t productive. I would ask her coach if her play has significantly improved as a result of Kev/Zx. That would be the test. I would ask her coach if her play has significantly improved as a result of Kev/Zx. I keep telling her she could go back to the college's Tour Bite whenever she wants and I'll string her rackets. She insists she likes where she is at and has been playing these strings since the summer after a life of poly. She is 7-0 in duals. The coach knows what she is up to and said as long as she keeps winning. But from a purely academic standpoint I am interested in figuring out how best to string this hybrid and if it has any utility in something other than simple rec tennis. Up to this point the best player who I have strung this hybrid for is a former ranked junior, played DII tennis but is 32 yrs old and has lost a half step. I didn't encourage this just provided opportunities and options. She was top 5 junior once upon a time in a country that has a population of over 100mil. Things change, life moves on. Heck, I would string a racket or two a day for her if she wanted syn gut or poly - whatever. But to get back to the subject of this thread, she does like winch prestretched Ash Kev mains and manually prestretched ZX crosses. We have tried no prestretched and simple double or triple pulling. She says those beds are OK and there is a 5 minute adjustment, she prefers prestretched. Years from now, we will look back on this post as the origin story for old man graycrait’s legendary rise from garage tinkerer to personal stringer of choice for a grand slam champ. Strongly disagree that there are too many factors going on with the setup I described. It really is quite simple. Pre-stretch takes a couple minutes. I NEVER experience ZXP (or Kevlar) string breaks while stringing them as hybrid....only as ZXP full bed. Same goes for consistency off of the string bed -- I only found this problem with full bed ZXP, not Kev/ZXP. Just wanted to clarify. No skin off of my back (or anyone else's) if you aren't interested in this combo. @USPTARF97 - Why are you on this thread? If you won't string it for yourself or for others why expend energy denigrating it? It is just tennis string, hardly worth the bother except for a few of us nerds. The rest of the tennis world seems pretty well satisfied with short lived plastic "wire." The tennis industry, athletes and coaches are always looking for the next best product to help players produce the best tennis possible. Although the Kev/Zx is interesting, this thread, which is the only comprehensive discussion about this set up, points out many issues. Crossfire/ Zx or variations didn’t just come out. It has been out long enough for it to decrease in price by about 60-65% due to the lack of interest in the strings. Where it once was $21.00 it is $8.50. I see nothing here that would indicate that Kevlar/Zx is going to become a big player on the recreational level much less used in professional tennis. The tennis community does seem to be doing rather well with natural gut, poly, synthetics etc. If something better comes out then players will move in that direction. Innovation is always worth taking a look but high level players have a very small window of time to compete. Most will choose the most proven setups. The tennis industry, athletes and coaches are always looking for the next best product to help players produce the best tennis possible. Although the Kev/Zx is interesting, this thread, which is the only comprehensive discussion about this type is set up, points out many issues. This set up didn’t just come out. It has been out long enough for it to decrease in price by about 60-65% due to the lack of interest in the strings. Where it once was $21.00 it is $8.50. I see nothing here that would indicate that Kevlar/Zx is going to become a big player on the recreational level much less used in professional tennis. Humour us. Try it for yourself and let us know what you think. Can't understand the huge differential of 90lbs/40lbs (50lbs differential) but I suspect it wouldn't make much of a difference or feel even worse since I went for an even higher differential and didn't like it. Cmon now -- if you are going to try and make an argument at least be accurate. Crossfire was NEVER $21/set. And, it isn't $8.50/set either. TW is currently running a promo (like they do on quite a few strings) which discounts to $8.50 a set when buying 4 or more. They are currently running a similar promo on Head, Gamma, Gosen, Prince, Technifibre, and Isospeed strings. I agree that Kev/ZX will likely never be big with rec or professional tennis. 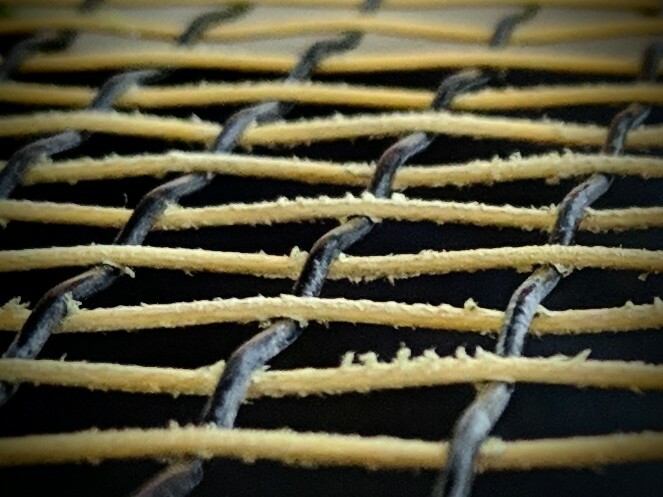 First, the strings are not readily available in most local shops, most rec players string maybe once or twice a year max, Kevlar has a historical reputation (old tech, harsh, etc. ), ZXP doesn't really have a reputation (most would mistake it as a poly) and benefits from some extra labor (pre-stretch). And, the pros frankly like what they like, don't generally have much financial limitation when it comes to strings, and only need a string setup to last a couple hours, if even. Finally, I agree that this thread points out some of issues/downsides of Kev/ZX. However, it also points out the many benefits. If you don't have experience with this setup or are not willing to develop experience with it I am not sure how much you can contribute to the collective knowledge on it. I’ve found that there is a huge difference between zx and poly when using it as a cross with Kevlar with mains at higher tensions. The higher tension accentuates the harshness of the poly, while the comfort of zx shines. Before you start insulting someone you should do a little research. Right now at ******** Sports it is $8.50 with a line drawn through $21. Try google before you start typing misinformation. Have you ever looked at a string and realized that it wasn’t for you without having to buy it and use it? I’m sure you have just as everyone has. People reading this thread can make an educated guess about whether or not they want to use this set up. Believe or not there are people on here with tremendous experience. Weren’t you the one who was saying before that zx was too expensive to bother trying? Now you’re saying you don’t want to try it because the price has dropped? Okay, let's address this one. One of the 4 major online tennis retailers is selling Crossfire ZX for $8.50/set with a claimed original price of $21. I agree and congratulations on the find as I try to always support TW (so I didn't look at their site). I have no idea if they have actually ever listed or sold a set at that price (my guess is no). Now, with that said, the other 2 major online tennis retailers (not TW) are currently selling Crossfire at their normal price of $11.00-$11.30/set, with one also offering a combo discount of $8.47/set when buying 4 or more. I won't bother Steve at Ashaway to ask what the "MSRP" is on this string but I am quite confident it is not $21. But, whatever....retailers have been known to artificially inflate list prices at times and I wouldn't be surprised if that is what we see at play here. Have you ever looked at a string and realized that it wasn’t for you without having to buy it and use it? I’m sure you have just as everyone has. Of course I have, and I move on and use a string I think might work for me instead. What I definitely don't do is troll threads about strings I have no interest in using, especially if I have zero experience with them. Rather, I come to this thread to share my direct knowledge/experience with this setup and have been transparent about what I perceive as pros and cons. For a lot of people here, Kev/ZX has been great. For some, it hasn't worked out. This thread is to share that knowledge. I am not here for an argument -- what is your motivation for continuing to post here? At $8.50/set, you should try it out and report back for the benefit of this community. People reading this thread can make an educated guess about whether or not they want to use this set up. Believe or not there are people on here with tremendous experience. I agree 100%. I will trust those with experience that combines theory and experiential evidence, with emphasis on practical application. PS -- the pricing discussion above all relates to Crossfire ZX. I have never used that particular setup. I have only used Ashaway Kevlar 16g and Monogut ZX Pro 17g (in both black and natural). The Kevlar in the Crossfire packs has PTFE in it and has been reported to play differently than regular Ashaway Kev. If you guys find more great buys on ZX or Ash Kev let me know. I've got to feed the kid's habit Plus I like to have one Prince with Ash/Kev x Zyex and a matched racket strung with poly/poly. I'm still building a 2 pair "matched" collection of favored 1980s 90"s Princes. Graphtech DB 90s in grip #4 with decent grommets don't "grow on trees." Thanks @Ultra 2 . I've got a "wall" of OS Princes but I have drifted to the 90s for daily play. 1980s 90"s Prince grommets don't "grow on trees." Yes, used to be very expensive and now that it has dropped it still doesn’t appeal after reading the issues that come with the set up. Better off where I am and so are the players I have worked with. I am sure there are benefits to this set up but none that would make me string my frames with Kevlar, go through all the trouble of extensive pre-stretching, strings breaking on the stringer, using high differentials and putting that kind of stress on my frames, breaking strings in a week and a half, having the strings lock up after a short period of time, and did I mention there is s significant number of people posting that this set up hurt their arm? That’s great that you guys have found something that plays well for you but I see no reason to venture off into Kevlar set ups when I am playing well for $4 dollars a frame with full poly. I’m still inquiring as I go to events all over the country and set ups with Kevlar and high differentials are non existent. Yes, used to be very expensive and now that it has dropped it still doesn’t appeal after reading the issues that come with the set up. Better off where I am and so are the players I have worked with. I am sure there are benefits to this set up but none that would make me string my frames with Kevlar, go through all the trouble of extensive pre-stretching, strings breaking on the stringer, using high differentials and putting that kind of stress on my frames, breaking strings in a week and a half, having the strings lock up after a short period of time, and did I mention there is s significant number of people posting that this set up hurt their arm. If you say so, Sam-I-Am. My jump back into Kevlar string with the long discontinued Prince Perception Control was an eye opener (stability, decent spin despite coated kevlar) so I'm anxiously awaiting the Ashaway Kevlar 1/2 reel in the mail. Reasons why I like Ash Kev x ZX. 1. Plays sort of like poly and doesn't hurt my arm. I have never had Ash Kev x ZX lockup. I have had Ash Kev lock op with the following crosses: syn gut, Origin, poly, multi. It is kind of interesting how fast and how tightly Ash Kev x Syn Gut can lock up. I have an older player friend who plays a Ti6 who loves that locked up stringbed, which says something about his tennis. I hit with a wide variety of people some for tennis some for conversation and for joking around. 2. For me Ash Kev x ZX plays a month or so, even though my young friend saws through hers in a week and a half due to her racket heads speed being quite a bit faster than mine. You should see how fast these kids go through poly. One of the D1 guys told me he had to get a good job after college to pay for strings because he would go through poly in about 2 hrs. Now that I have engraved an ID number on each of my college friend's rackets and started a log I will have exact dates of breakage. I am curious to verify her feeling that it seems like it breaks in a week and half. She has 9 rackets strung with it and I am not sure if she has a system of rotation or plays one racket at a time and if she does have a system does she stick with it? 3. I like to string it in a racket, play for a week or two with that racket, then hang that racket on the wall for a month or 6, then come back to that racket. I currently have 18 Prince rackets strung with Ash Kev x ZX. Ash Kev x ZX does well in that scenario. I have 21 other rackets strung with something else. For how I play and use a racket Ash Kev x ZX costs me about 11.00 a set. About the only poly I like playing with costs at least 10.00 a set but last less than a week for me. Multis - I rarely use. I mess around with syn gut but in my mind it last about as long as poly, maybe less. For me Ash Kev x ZX is cheaper per court hr while giving me some poly like attributes with more comfort than any other stringbed. I've tried fullbed Nat Gut and NG x poly a number of times using Wilson, Luxilon, Pacific and Klip. Good NG x poly is roughly a 30.00 stringbed vs an 11.00 Ash Kev x ZX stringbed. Probably because of my skill set I play at least as well using Ash Kev x ZX. My college player friend even had one of her rackets strung with Nat Gut x ZX and asked me if I would replace it with Ash Kev x ZX. 4. When I start feeling an elbow or shoulder issue from my poly experiments I now immediately go back to playing with a 19mm all graphite Prince strung with Ash Kev x ZX and I heal up while playing. Sam-I-am is the character in Dr Seuss who is constantly trying to get the others to try Green Eggs and Ham. I believe you would fall more in that category with this push for Kev/Zx and high differentials. I’m just participating in a thread titled “in praise of Kevlar/zx” which is dedicated to reviews of this extremely unique stringbed type. If you want to post a review, go ahead. But posting dozen of negative comments without even trying something is not cool. Praise on! But you guys have given me enough information to avoid this set up. For that..I thank you. That is why threads with an abundance of information are so productive. People can make educated decisions about whether or not certain equipment or set ups are right for them with out wasting money and time to find out. Others may read this and think is sounds great for their game and they would love to experiment with this process. We make educated decisions every year when new frame specs come out about whether or not they are a good fit for ourselves or certain players. They don’t have to hit with every frame available to figure it out and neither do I. Not sure why with the wealth of knowledge, you and Shroud are unable to figure out that people do the same thing with string set ups. Just came back to experimenting with kev/zx. Strung up 18 ga ashaway kevlar with 17ga ZX. I went with 70/45. And fully prestretched them both. Yesterday, i went to the ball machine. The first 50 balls or so were amazing.... And then i noticed that the stringbed starts to lock up. Not as bad as playing with a full bed of syn gut but strings are noticably out of place. And now , im adjusting the stringbed all the time. It's more than just adjusting the strings. You can feel that the kev just doesn't slide well over the zx anymore. It creaks. What am i missing here? This combo certainly doesn't have the slide and snapback of playing with a full bed of Alu Power. The kevlar has great bite but I'm wondering if a think round, higher power poly would be better in the crosses than the zx. Thanks. Though i need to be out on the court. Leagues are forming and I think i will play. Hey Shroud, Good luck to you this spring. I have been talked into playing on two teams. Going to have to be in shape to pull this off and still be able to function. Thanks You Too. Recovery is sadly where things seem to break down. Its sad that a few sets of DOUBLES can take its toll. Yep, I'm one of those. Absolutely loved the playability of AshKev/ZX, great spin, great control, sufficient power. But, it hurt the heck out of my elbow, definitely worse than any full bed of poly I've tried. @ashridge ,What racket, string pattern, tensions and whether you prestretched or not when you experienced elbow issues using Ash Kev x ZX? Also what is your normal poly set up in that racket. Just curious so I can log those for future experiments. I tried 65/50 but didn’t like it. Felt boardy and powerless and comfort wasn’t bad but not great as well...moreover I got less durability compared to 60/45. I was getting 15-16 hours now I got only around 12 hours. Back to 60/45 and everything is so nice, great comfort, control, spin and decent power. Btw I am using kev 16 and ZXP 17. I rely on a stringer and he may not be doing everything perfectly but this combo still feels really great and amazing especially in the match situations...will 65/45 be as comfortable if not more than 60/45? I played AshKev/ZX (17 gauge on both) at 60x40 in my Wilson RF97A, both mains and crosses pre-stretched. I only ended up keeping that racquet for a few months because it ended up being too stiff for my elbow and a little too heavy for my shoulder. Before I bought it, I did demo it from TW with a full bed of Luxilon 4G @ 53 lbs., before I knew that 4G was one of the stiffest poly's on the market. 4G hurt my elbow a lot, but not as much as AshKev/ZX. The weird thing about AshKev/ZX is that my arm pain didn't get really bad until a couple of days after I played, it was a delayed reaction, whereas playing 4G my arm was hurting during the match and immediately after, needed to ice straightaway after I finished playing. Several weeks ago I borrowed an RF97 from the local Wilson dealer on his insistence for a couple of days. I hit with it about 15 minutes before putting it up. It was strung up with some Luxilon string, don't know which. I play with 12oz+ rackets every day and do hit with full poly stringbeds generally in the 52-58lb area. The RF97 had a harsh feel to me. After having two bouts of TE in the last 10 yrs my "elbow sense" sends warning signals out right away. For instance I like Ash Kev x ZX in 19mm beamed graphite Princes and not much else from a personal standpoint. Although in the more muted Prince Spectrum 90 it plays fine even with the Graphite/Kevlar/Fiberglas/Ceramic composite frame. In the Prince CTS Approach 90 and the Prince Graphtech DB 90 I prefer full poly. In the Prince Graphite Pro 90 I like Ash Kev x ZX over poly. Rackets that I like I usually have at least 2 or 3 copies with one usually strung with Ash Kev x ZX and the others with something else. Please describe what you mean by worse. I played AshKev/ZX (17 gauge on both) at 60x40 in my Wilson RF97A, both mains and crosses pre-stretched. I only ended up keeping that racquet for a few months because it ended up being too stiff for my elbow and a little too heavy for my shoulder. The RF97 is set up to play Gut/poly. Using that frame full poly is very harsh unless you go low tension. Found that the RF with low tension has too much power. Have played some poly/syn gut set ups with it at 48/52 and played well just doesn’t compare to Gut/poly in that frame. It is very string specific. Despite the higher differential supposedly meant to help it move it back into position more quickly, it didn't. Also, the hoop shrunk which I did not like.